Bershan Shaw is a woman that leads by example, has a heart of gold, and truly wants to see everyone that she comes in contact succeed! She has the mindset that anyone can win in life and win BIG! She teaches that failing is not an option, especially if you’re connected with her. Who is Bershan Shaw at her core? Bershan Shaw is a survivor, a thriver, a friend, a daughter to her dad whom she is so close to like a best friend. Bershan is a TV personality who wants to spread love and motivation that nothing can get in your way only if you let it. Bershan is an international transformational speaker. Bershan is a business and leadership coach, a speaker coach and presentation skills expert. 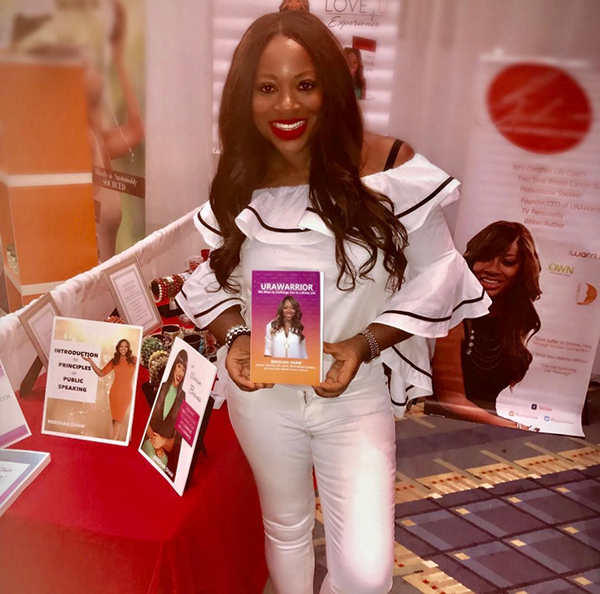 Bershan is a woman who has found herself and she finally has realized that she doesn’t need validation from anyone anymore. Bershan is no longer a people pleaser, Bershan Shaw is a warrior. Why are you so passionate about helping young girls and women thrive? I am so passionate about helping young girls and women thrive because when I first got diagnosed and the doctor told me that my breast cancer had spread throughout my body. It was in my bloodstream and that I had stage four breast cancer, I thought it was the end. I thought my life was over, I couldn’t believe this was happening to me and I didn’t know why it was happening to me. I wasn’t married, I didn’t have any children and I thought my life was over. The doctor said, “Well do you believe in miracles?”, something deep inside of my spirit connected with my inner warrior and it was like a jolt of faith that went into my system and I said, “Hell yeah, I believe in miracles”. At that moment I said to myself: “Yes I believe in miracles and I believe in myself. I have never been through such a huge battle but I can do this. I have overcome a lot of different things”. That’s just what I did, I’m ten years no evidence of disease-cancer free. I made a promise to God and the universe that day that I will never let any doctor or man write my story. Cancer was my diagnosis not my prognosis, I went into the hallway and got on my knees between me and GOD. So I said “I will promise help young girls and women realize that they can overcome any adversity they are going through. That they could be strong, brave and have confidence to go through whatever CANCER that is holding them back. Because CANCER is more than the disease, it’s cancerous people and things in our life”. I made a pact with GOD that I would be the connector in helping women and young girls overcome any obstacles that come their way. I began mentoring and coaching women at homeless shelters because just like I needed someone to support me through my difficult times I wanted to do the same for other women, it was called the Oprah Coffee Club. These women thought I was saving them in reality they were saving me. I made a pact with God to help women and I’m keeping my word until the day I die. Tell us about your businesses. I’m what you call a multi-preneur, I’m an international motivational speaker. I have spoken in places like Poland, Ghana, Rome, Germany, London and more. I’m a business and leadership coach. I help managers and C suite level executives become better leaders and help them with team management, employee motivation and dysfunctional behaviors in their workplace. I have a personal development business where I coach individuals and corporate teams from speaker and presentation coaching to emotional intelligence. I would say I’m a strategist and a guru at human behavior. I invest in real estate so I own properties in multiple cities and I am launching my ‘I AM A WARRIOR’ Jewelry line and an IAMAWARRIOR app and digital academy for personal development. So, I would say I like keeping myself pretty busy. My brand is I AM A WARRIOR because it resonates with the soul. It makes you feel like even when you fall you can get back up and do it because YOU ARE A WARRIOR. My business is broken into four parts: Part One: Business Leadership Coach/Emotional Intelligence Leader/Diversity & Inclusion Expert, Part Two: Speaker & Presentation Coach, Part Three: Personal Development Coaching and Training in Life and Relationship, and Part Four: Products – Workbooks, Jewelry and Digital Academy and my jewelry line. In the next two years I would have an International best seller book out and my business will be global in Europe, India, Australia and Africa. I will have my digital academy up and my app and I will be speaking on stages with politicians, leaders and CEO’S. I think big. If you think small you will be small and in five years I will have my television show syndicating world wide. I will have another international best seller. My jewelry line will be a sensation international and my personal development will be global helping women when they need someone to support them, coach them, mentor them or just to be a listening voice. My IAMAWARRIOR app will be there for them., my coaching business and speaking business will be universal. Bershan is the epitome of God’s grace on display! She takes all excuses off of the table. If she can have a great attitude every, single day,so can you! She has taught us that No Matter What, You Can Make It!